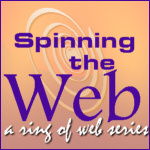 The "Spinning the Web" webring is a linked group of original online entertainment series. If you're searching for something to grip your emotions and kindle the imagination, this is the right place! You'll find everything from dramas to comics to science fiction to soap operas to animated serials. Click now to visit our directory of web series. Or, if you're a producer, writer or artist for a site that provides continuing entertainment for the web, joining our webring and its community of sites will help promote your work, and will link you to a growing network of artists like yourself. And don't miss the Episodic Review -- the premiere guide to online entertainment series.